Nilfisk Bravo - Family friendly dust-eater vacuum cleaner - ideal with kids and pets in the house! No need to get stuck... with Nilfisk Drain & Tube Cleaner the problem is solved! This light, compact and easy to handle Nilfisk high-pressure washer is ideal for basic garden cleaning. It offers a maximum pressure of 110 bar - which is enough to be efficient on light to modarately dirty surfaces. 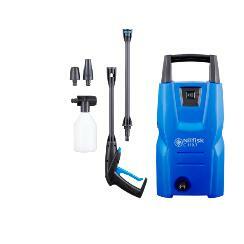 To increase performance, this Nilfisk comes with Click&Clean connectivity for a range of optional accessories. Aluminum pump for high durability. Handles mildly dirty surfaces up to 25 m2/ hour. Choice of Tornado or Powerspeed (high impact) nozzles. Compact and easy to use, move around and store. The X-TRA model features a built-in trolley for increased mobility.